Fortissimo is our way of paying respect to the pioneers of Tuscany who challenged the traditions of winemaking in the 50s and 60s to gain recognition for their wines. 2016 Fortissimo is comprised of 76% Merlot, 9% Sangiovese, 8% Cabernet Sauvignon and 7% Cabernet Franc. Albeit young, this wine is as outstanding as we thought it would be; all the components are married seamlessly together. The large format puncheons and Hungarian/Slavonian oak are evident in the subtle way the oak is present. Overall the wine has fantastic layers of fruit and savoury flavours. Bing cherry mingles with red and black cherry fruit. Grilled aromatic herbs meet cured tobacco leaves. The Palate is layered and while is still young and morphed into itself, it still offers plenty of pleasure in youth. One built for early drinking or cellaring with a medium+ aging curve ahead. Veal Osso Bucco or Tuscan Roast Lamb with a rosemary crust. Son nom pourrait faire craindre le pire, mais cet assemblage de merlot, de cabernet sauvignon, de sangiovese et de cabernet franc n’a rien d’une brute qui donne dans la puissance et dans la force. Le merlot confère au vin sa rondeur et ses parfums de prune et de cerise, tandis que les acteurs de second plan apportent de la vigueur tannique et des accents de graphite, de poivron rouge et de cuir. En somme, un vin élégant, digeste et plein de fraîcheur, qui procure beaucoup de plaisir à table. Excellent rapport qualité-prix. Fine and fleshy, dark fruit scented, savoury, firm, drinkable, with fine acids, succulent and juicy. Plenty of dark cherry fruit, damson plums, black raspberry and more, with really nicely integrated wood influence. A balanced, savoury, essence, with very good to excellent length. Fortissimo is such an epic expression of south Okanagan Merlot. The nose simply detonates with ripe plum, fruitcake, floral perfume, and distinct herbal fragrance. I really admire how the rich flavours unfold – first with black cherry, then juicy raspberry, then dark chocolate, and finally a truly Italiante walnut skin bitterness to add a pleasant nip to the long finish. Potent yet juicy, with old world earthy vinosity, I swear you can really sense the 8% Sangiovese that kicks up 76% Merlot. 9% Cabernet Sauvignon, and 7% Franc. Do deploy at the dinner table with roast lamb or pancetta-wrapped pork roast. Tasted blind at NWAC June 2018. 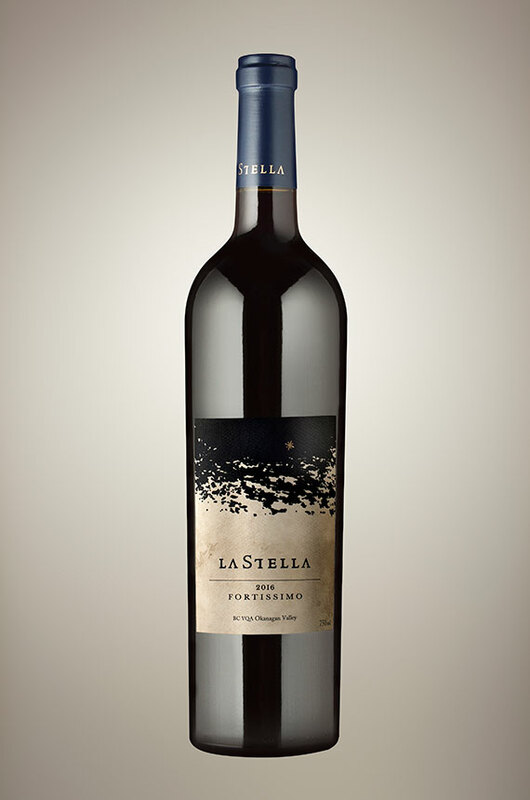 Fortissimo is based on merlot (76%) with smaller portions of cabernet sauvignon, sangiovese and cabernet franc. It has a quite lovely lifted, complex and savoury nose of fresh herbs/straw, cedar and spice around currant fruit. It is quite full bodied and powerful (14.3%) yet manages some mid-palate finesse as well, which I attribute to the vintage and inclusion of the cab franc and sangiovese. It is nicely focused, balanced and interesting with that dusty, herbal note carrying well. The length is very good to excellent. Best in another year or three.